High blood pressure is a “silent killer“. The reason it is known as a silent killer is that it works behind the scenes to cause damage, meaning you may not feel sick. Hypertension is a common disease amongst adults in the United States. Of those with high blood pressure, only 48.3% have their blood pressure under control. This means that 51.7% of the adult population DO NOT have their blood pressure well controlled. Your blood pressure is an important factor that can be influenced by many things. If it is too low or too high it can become a problem. There are many risk factors for high blood pressure which include advancing age, obesity, family history, race, a high sodium diet (more than 3 grams per day), excessive alcohol intake, and a sedentary lifestyle. As we get older, a reason our blood pressure goes up is that arteries get harder, which causes blood to flow through them less easily…it is all about the flow! There are many things we can do to lower blood pressure without medications. Unfortunately, age is not a modifiable risk factor (despite our efforts to slow down the clock), so let us move on to things we can fix! In addition to taking prescription medications to lower blood pressure, here are some natural things you can do to help: improve diet, lower weight, optimize exercise routines, and lower alcohol intake. Aerobic exercise is a great way to not only help lower your blood pressure, but to lower your weight. Exercise is a double whammy! It is recommended to participate in moderate-intensity aerobic exercise 3 to 4 times per week for about 40 minutes each time. For those of us who do not exercise at all that may seem like a daunting notion. However, any amount of exercise that you add to your regimen is beneficial. And always start small. Do you have 10 minutes of the day to walk, play tennis, swim, or bike ride? The DASH diet (Dietary Approach to Stop Hypertension) is recommended. Don’t think of this is “dieting” though, use it as a guideline to help yourself improve your meal options by increasing foods that are good for you such as vegetables, fruits, low fat dairy, whole grains, poultry, fish, and nuts. Also, by lowering your intake of foods that are not so good for you such as sweets, sugary drinks, and red meats. Potassium, calcium, good protein, and fiber are beneficial nutrients that the DASH diet focuses on. The foods to avoid are those high in saturated and total fats, and cholesterol. Maximum alcohol intake per day should not be greater than 2 standard sized drinks for males, and 1 standard sized drink for females. There is an increased risk of high blood pressure in those who drink alcohol versus those who don’t. In case you were thinking of having a big gulp sized drink, let us clarify what exactly a “standard” drink is! So, how do we know if our high blood pressure is under control or not? By monitoring it at home! Home blood pressure readings are an important complement to doctor office readings. If you do not have a home blood pressure device, it is important to obtain one. When taking your blood pressure at home, take the reading 5 minutes after you are rested in a seated position. Make sure your back and arm are supported and your legs are uncrossed. Once you have taken your blood pressure, WRITE IT DOWN in your blood pressure log and bring it with you to your next doctor visit. As high blood pressure is one of the most modifiable risk factors for early heart disease, it is important to get it under control. Making changes can be difficult. Start with a small change and add in other changes as you master each one. Don’t forget that it is alright to fall off the wagon, just remember it is never too late get back on it! *Your healthcare provider may prefer a different blood pressure goal for you. 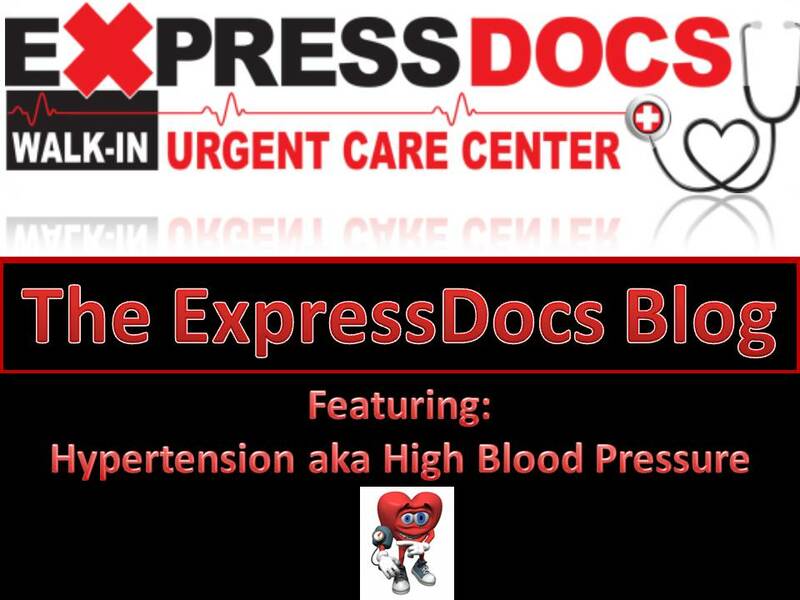 Please consult your healthcare provider or come in to ExpressDocs if you have any specific questions regarding your personal health. This blog post, as well as all others, is tailored to the more general guidelines. For this reason, it is always important to consult your personal provider for specific health questions directly related to you.